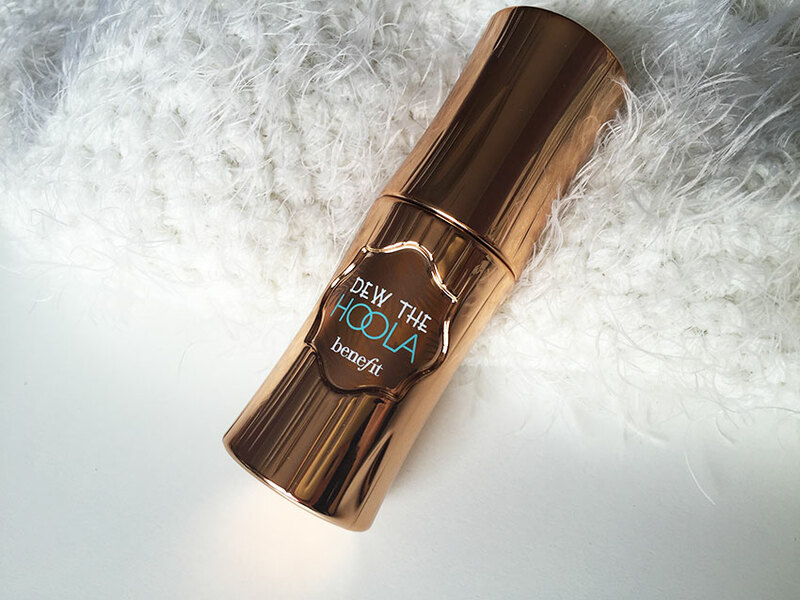 If you know me at all, you will know that Hoola by Benefit is one of my all time favourite products, I have repurchased it numerous times and will continue to for as long as they are making it. I never try other bronzers or contouring products because I just can't seem to let go of my wonderful Hoola (I really need to try some more though, just to get me out my comfort zone). If you are a regular Benefit buyer or you keep updated with all the new lines of products you would know that Benefit recently released a whole new Hoola line, and of course I just had to try it out. 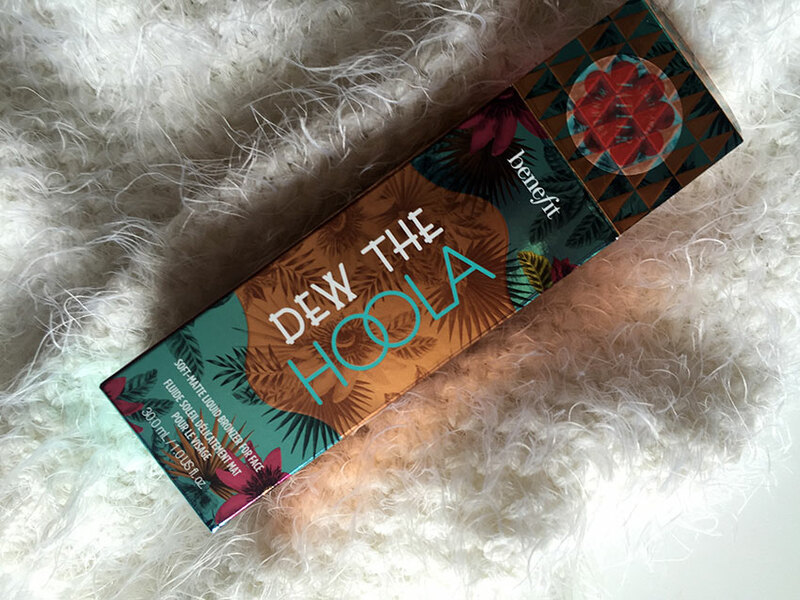 I recently bought the Dew the Hoola product from the new line, it is the 'soft matte liquid bronzer for face' and I am absolutely obsessed with it already. I have never really used a liquid bronzer before and the idea of it kind of terrified me a little, I was worried I would apply too much and make myself look dirty with brown patches on my skin. But since Hoola is my favourite product of them all I just had to step out of my comfort zone and give it a try. The packaging is absolutely gorgeous, from the box that it comes in to the packaging of the actual product everything is so sleek and beautiful. The box has a wonderful Hawaiian tropic feel to it and I am so tempted to have it sat out beside my lipsticks and make up collection just because it is so gorgeous. On the top of the box it has a little sticker to say it won the Tatler beauty award and I definitely see why. The packaging of the actual product is just as beautiful, if not more. A 30ml rose gold bottle that looks like a stick of bamboo to keep in line with the Hawaiian tropic feel. A little plaque of a metallic chocolate brown which says 'DEW THE HOOLA' followed by the Benefit logo. It is so gorgeous I will be putting it show among my make up collection for sure. Once you pop the cap off it is a little push down spray in the stunning rose gold with a white nozzle. 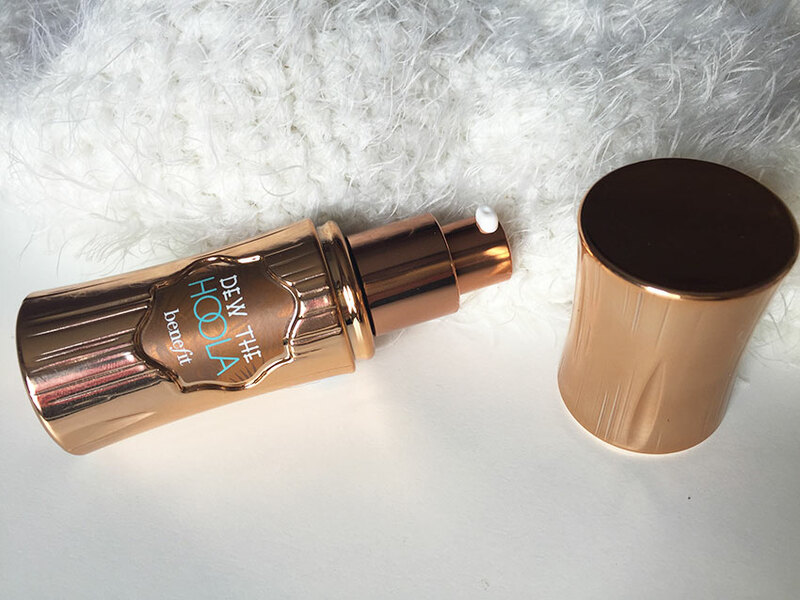 The product is beyond stunning, but because it is a shimmering rose gold tone it does show all the fingerprints very easily and if you are putting it on show definitely wipe it down regularly as I imagine it would also show the make up stains very easily. Inside the box beside the product is a little leaflet. I won't lie I very rarely read these leaflets, but I unfolded this one and was super glad I did. One the back is of course all the little descriptions in 100 different languages and on the front is some tips for how to use the product. It shows you where to apply over foundation for a contoured look and where to apply to a makeup-less face for a natural undetected bronze look. The part we have all been waiting for, I do not blame you if you skipped right to this section, after all it is what we all want to know about right? First of all I have to say a little shoutout to the scent, y'all know how weak I get when a product smells good, I mean I won't buy a badly scented product. This product smells like being on a beach in Hawaii sipping a cocktail, it's B-E-A-UTIFUL. I am horrid at describing scents, so I wont't even try to tell you about it just go to your nearest Benefit counter and have a good ol' sniff of their tester. 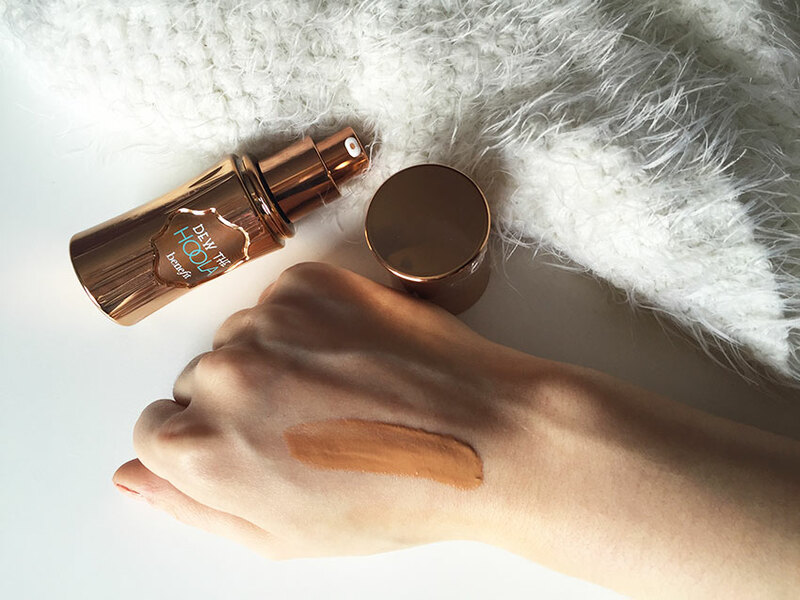 The colour of the product is identical to the original powder Hoola and although it is a liquid and of course looks wet when plumped out it goes on completely matte. I apply a little (very little, you do not need a lit of this product at all) to my hand and with a brush I apply it under my cheekbones and if I am going for a more contoured look onto the top of my forehead right before my hairline to make my massive forehead look a little smaller. With a beauty blender/my fingers (you can also use a brush of your preference) I push it into the skin to create a natural looking bronzed look that enhances my cheekbones and gives me the illusion of the smaller forehead. I applied too much, oh nooooo! Although I did say apply a small pump to your hand because a little goes a long way, the product is very buildable, you can create a natural look from a tiny drop or build it up to create a more dramatic contoured look. It is an extremely easy product to blend and is incredible smooth. No hard work is needed, you can give minimal effort and look incredible. You can of course team it up with the original powder Hoola. 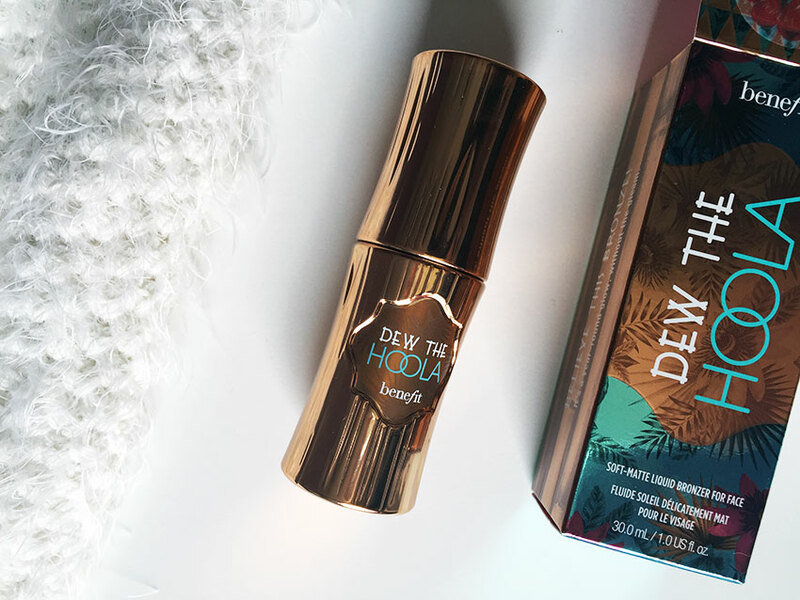 Have you tried Dew the Hoola? Will you try it? What's your favourite bronzer?